In fact his daily strip on August 8th, 1970 also has Porky saying it. I don’t have a date for the strip you show, but clearly he was pretty happy with the phrase and didn’t mind repeating it. I will be happy to send you an image of the 8/8/70 strip if you are interested. By the way, Kelly is my favorite comic satirist, ever. No one but Will Rogers has ever matched his ability to make a wicked point and at the same time be “gentle” to the object of his wit. Thank you for the comment on Pogo in the “Morphology” blog. I always enjoy reading the points of view of other aficionados of the art form on my writing. I, too, enjoy reading Pogo and appreciate Walt Kelly’s humor. If you want to read more of my research on Kelly, I give him some ink in my masters thesis “More than Words: Rhetorical Devices in American Political Cartoons” by Lawrence R. Bush. In that essay I talk about his use of calligraphy to enhance his satire. 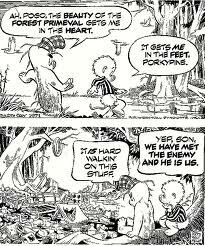 I agree with you that Walt Kelly was very clever in the way he presented his political satire. The reason for his cleverness was that the “funnies” was not the place for political satire. Therefore, he disguised it as random animals doing things in a swamp. Any connection to the events in Washington were purely coincidental (like comments in Pat Oliphant’s cartoons by Punk the Penguin). Kelly’s work opened the door to more direct satire in “the funnies” by the authors of Doonesbury, Bloom County, Shoe, Candorville, and Non-Sequitur (to name a few). In addition, the humor of Will Rogers inspired political cartoonists in their drawings. See “Art of the Poison Pens” for one example. It was a perfect skewering of the dysfunction of the USSR with black humor that only Kelly could make appealing to a young kid. Thank you for reading my blog. Walt Kelly had a bunch of “Kellyisms” that made light of difficult situations. That Trans-Siberian Railway never ran on time. Take two loaves of bread. Your comment is controversial, but deserves to be published. I was once told that when Freud was badmouthed by a peer, his reply was, “What did I ever do for him?” However, this story is apocryphal because I cannot find a source for it. It goes along with your parenthetical comment. parenthetical sounds cool…. To just throw out there. I posted that too. I agree with you. It was a spin on a previous comment regarding the human condition. “Parenthetical” is a pretty heavy word. Don’t try to throw it too far. That’s an interesting bit of research. However, the final, and best known version is also the most concise version which is very common in the coinage of new phrases. Since you seemed interested in the history of the phrase, and whether it originated in the strip or on a poster, I thought you might appreciate knowing Kelly’s first usage of it. That’s all. I may not have made myself clear. Yes, the research fascinates me. I did not go into that much depth. Had I found what you found, I would have put it into my blog then explained that many original phrases are pared down to the most concise wording before they become popular catch-phrases. Thank you for bringing me up to speed. So, nations meet their enemies and find out they are us? How apt after the election of Donald Trump. Yeah, it’s still “us,” especially with Trump having the codes. You guys are driving me Krazy.I had a pogo cartoon on my dorm room wall(1966-1969) of pogo with a folded paper hat on his head brandishing a wooden sword saying” I’ve met the enemy and it is us”.(? ).It was the center piece of a collage that covered all 4 walls and the ceiling.My “roomie” and I would sometimes greet each other with fake sword fight and repeating this quote.This clearly preceded 1970,that every one seems to agree was the first Pogo appearance of quote on the earth day poster.Help me put this to rest.Please,no 60’s jokes. Although I was not in college during the 1960s, I do remember those days (I was not old enough to do what it took to forget them). As for the famous quote, I have no record that Walt Kelly produced a cartoon with even the paraphrase you mention before the 1970s although it is possible that it has eluded me. I will keep my eyes open. Donald Adams, you are 100% correct. Pogo is standing on a hill above a battleground talking to the troops near him and made that statement. Walt Kelly absolutely drew that cartoon before the Earth Day knockoff. I don’t see this meme too much any more. What I do see is more and more people on all sides of all issues refusing to compromise. Anger is growing and growing and our political leaders are as blind to it as anyone. If Puritans get abortion repealed, you will see that concern a lot more often. There are folks who want to move the capital to Westboro Baptist Church. He may be just what the US needs. Trump has shaken us out of our reverie that things will just go along as they have and that both parties are equally bad. If Trump does not motivate America to vote for real change and respectability and demand responsibility in the administration, the US is in real trouble. Perhaps violent, extremist rhetoric is now the mainstream. Let’s hope it’s a phase and rhetoric can go back to being mundane. Good point. Trudeau has his pen on the pulse of America. 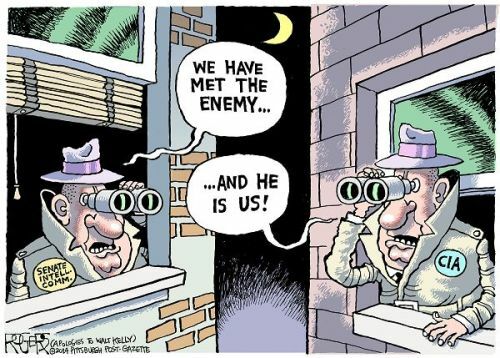 We have met the enemy and he is our President? Indeed. Many a political cartoonist has made that very point. I don’t know where you are from, but in the United States people are charged with crimes that they are suspected of committing not crimes someone of their religion may have committed. Your post suggests that all Muslims are inclined to commit acts of terror so they must all be exterminated. That makes as much sense as the government of New Zealand going after every white man in the country and charging each one with the murders at the mosques. Since one white man did it, all white men must be inclined to do it. We have met the enemy of peace and he is you.